"I hope you're not disappointed with your Mother's Day Gifts," I said to Gloria as I handed her a gift bag. "Well, you guys didn't have to get me anything," she said. "Expectations met!" I said brightly. Actually, she got flowers, an Asa CD, and a comprehensive guide to restaurants in Austin (she's a restaurant hound), so she did just fine. We were on our way home from Mother's Day Brunch (I recommend packing mace and a trebuchet to fight the crowds), and for some reason, I pointed to a restaurant on an interstate access road and said "Eli, that's where I met your mom." Well, um, no. Our friend Ellen called me from that restaurant (I think, although this is also in dispute) and said that I should come meet her and Gloria for lunch. I didn't. "The first time I met your Dad," Gloria said, with metronome-like precision, "was when we went out to the County Line." County Line is a locally famous barbecue restaurant. Well, um, no. That was wrong, too. "That was our first date," I said, "but I met her at her house when she threw a going away party for Ellen." "What? You didn't come to that party," she said. "This explains why you didn't call me back for a month," I said. "You didn't even think I was there." "I'm sure you didn't--oh, wait. You WERE there!" she said, and at that point, she got very embarrassed. Mortified, actually. Women pride themselves on having an encyclopedic knowledge of such things. "I remember that County Line date so vividly," she said, and launched into a long, very specific recounting. "Eli, this is important," I said. "When you've forgotten something really important, try to work your way back by talking about something else you remember really, really well." Eli 7.9 laughed. "I can't believe I forgot that!" Gloria said. "Dad forgot, too," Eli said. "I did, but it doesn't bother me," I said. "He has his strengths," Eli said to Gloria. My mom (who went with us) asked Eli to describe our personalities. He described me first, then thought for a few seconds about his mom. "Well, she's funny," he said. "And she's thin." "Well done, my man," I said. "Always get in the thin angle." "And she has a big head," Eli said, and we all burst out laughing. 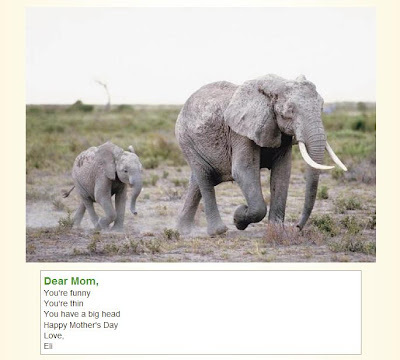 We didn't actually send her the card at the top of this post, but I thought we should memorialize the thought, at least.